More cost-effective than wood or plastic pallets. 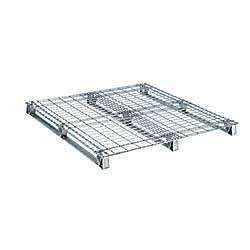 Heavy-duty 2-gauge, 2" x 4" wire mesh surface with 13-gauge stringers. Galvanized. Nestable. Four-way fork entry. IN STOCK. XP-0126 48" x 40"	 45	 2,500	 4,000	 48 x 40 x 4"
XP-0127 48" x 48"	 50	 2,500	 4,000	 48 x 48 x 4"